The primary payload of this flight is the Dubaisat-2 spacecraft, an electro-optical Earth observation satellite that was built by the Satrec Initiative and is operated by the Emirates Institution for Advanced Science and Technology. Imagery provided by the satellite will be commercialized for users in the United Arab Emirates and beyond. 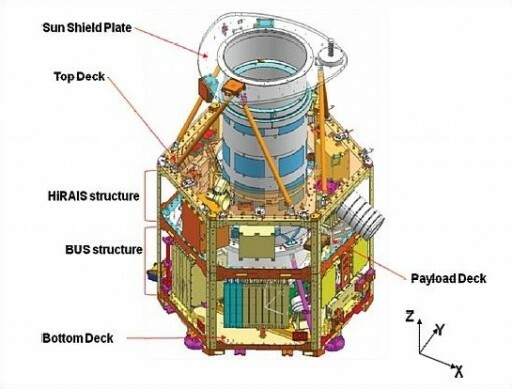 The satellite is based on the hexagonal SI-300 satellite bus being 1.5 by 1.95 meters in size with a mass of ~300 Kilograms. Four solar panels are attached to the sides of the satellite and deploy shortly after launch. Each array consists of six individual panels that each contain 26 cells. The solar arrays generate 450 Watts of power. The four solar arrays provide electrical power to a triple-redundant Battery Charging Regulator that manages the sate of charge of a Li-Ion battery. A Primary Power Conditioning Module and a Secondary Power Conditioning Module provide the satellite’s power bus. A regulated 28-Volt power bus is converted into unregulated buses at 15, 12 and 5 Volts. These voltages are distributed by the Primary & Secondary Power Distribution Modules. The EPS is a stable system that includes Safety and Separation Modules. 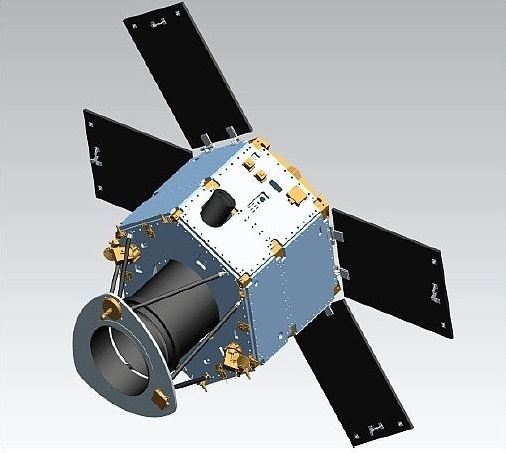 Dubaisat-2 is three-axis stabilized and its Attitude and Orbit Control Subsystem provides satellite pointing capability for single-strip, multi-strip and single-pass stereo imaging. 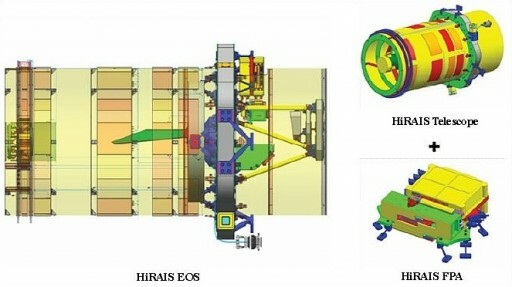 Five reaction wheels are used for attitude control along with four Fiber Optic Gyros. Attitude data is provided by Star Trackers for fine-pointing and magnetometers and sun sensors for coarse pointing in safe and acquisition mode. Dubaisat-2 has a pointing accuracy of 0.12 degrees on all axes. A Hall Effect Propulsion System is used for orbit maintenance and orbit adjustments. It uses electric propulsion utilizing Xenon gas and a microwave cathode. The Command and Data Handling System handles all telecommands sent to the satellite and collects all telemetry from the satellite’s subsystems. Two CAN networks with data rates of 500kbit/s are using a series of Interface Boards to connect all satellite modules to the networks. The Interface Boards are in charge of formatting telemetry data and handling messages received from the main computer. The Actuator Interface Board controls the speed of the reaction wheels and provides a speed feedback to the computers. Two Telemetry and Telecommand Boards are operated in hot-redundancy to perform all telecommand decoding and telemetry encoding directly interfacing with the S-Band system that is used for command uplink and telemetry downlink. The On-Board Computer is the central processing unit of the vehicle that communicates with all modules through the CAN network. All telemetry data from the various subsystems is processed and recorded. All telecommands are handled and executed by the system to control all the satellite’s functions. The computers run flight software using the VxWorks operating system. Onboard data storage us accomplished by Solid State Recorder Units with a total capacity of 256 Gbit. 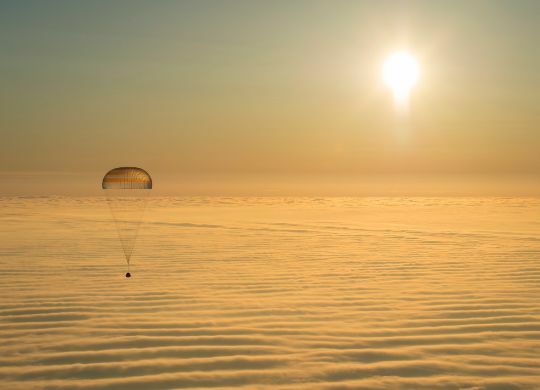 The satellite is equipped with an S-Band communications system for command uplink and telemetry downlink. Payload Data is downlinked via a high-speed X-Band terminal that achieves data rates of 160Mbit/s. The system uses a one-axis steerable antenna. The payload features a Korsch-type telescope with a five-mirror design. The main mirror of the satellite is 41.5 centimeters in diameter. Three mirrors are used to create a total focal length of 5.7 meters. A Flat Mirror reflects the light onto the Focal Plane Assembly. The mirrors are made from Zerodur that provides high-thermal stability. The telescope structure consists of Reinforced Carbon Fiber. A feedback heating system is used to keep the telescope components in perfect alignment featuring accurate thermostats and heaters along with passive heat-rejection systems.